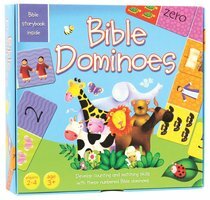 This educational game set includes 28 large, colourful dominoes with a mixture of Bible story characters, numbers, and animals to match; as well as instructions and a booklet explaining the stories featured on the cards. Great for home and Sunday school. Ages 3-7.